With super advanced equipment, tow-in access, and internet swell tracking, a growing number of surfers are getting rides on incredibly powerful waves. What makes a wave dangerous? Is sheer size an accurate indicator for how hazardous a surf spot is? 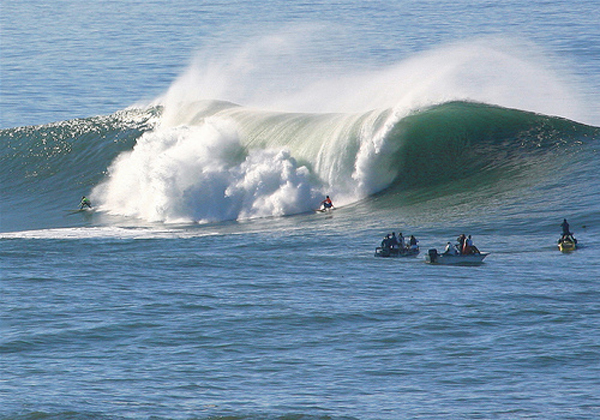 Read on for our roundup of the top ten most dangerous waves in the world. This ultra square-shaped, below sea level, one-eyed monster tops the list for good reasons. It’s impossible to paddle into on a surfboard and almost unrideable towing behind a jet ski. If you blow a wave here you’ll be washed straight onto the dry rocks, which is a bummer because the nearest medical help is hours away. The scary thing about Teahupoo (pronounced Cho-poo) is that as the swell gets beyond 10 feet the wave doesn’t so much get taller, it just gets more enormous, often looking like the entire ocean is peeling over with the lip. Falling off here is almost a guarantee of hitting the razor sharp coral reef below, which wouldn’t be so bad if the locals didn’t insist on using fresh Tahitian lime juice to sterilise the reef cuts. Ouch. Set along a remote length of pristine Tasmanian coastline, you could almost call this area picturesque if the wave itself wasn’t so ugly. Raw Antarctic swells come out of deep ocean and jack up into a roaring righthander in front of the cliff which gives the spot its name. The uneven reef causes weird steps and bubbles in the wave, which are always an unpleasant surprise when you’re still trying to navigate the drop down the face. It’s not that shallow and it doesn’t break in front of any rocks, but it is located off the tip of South Africa in the freezing Southern Ocean in shark-infested waters. 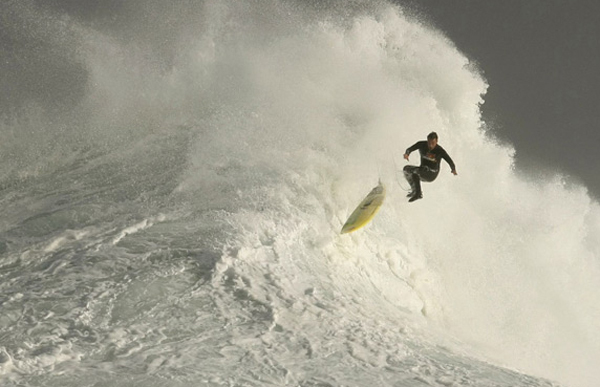 Dungeons regularly holds waves up to 70 feet, which is why organisers have chosen to put on the annual Big Wave Africa contest here since 1999. The shallow lava reef that shapes Pipe’s famous round tube is actually full of trenches and bumps — meaning a nasty old time for anyone falling out of the lip from 12 feet above. Which happens with surprisingly regularity, even to the experienced locals. 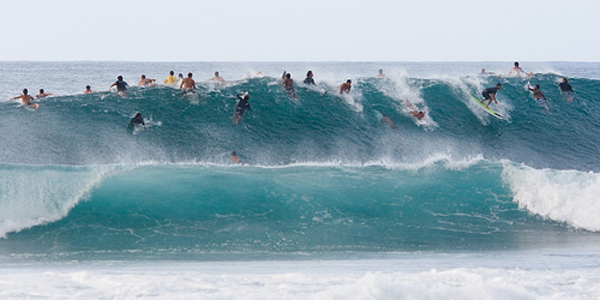 Perhaps almost as dangerous are the insane crowds that flock to Pipe any time it gets good, with fearless Hawaiians competing with pros, wannabes, and tourists for the set waves.